Living in the Yucatan Peninsula area of Mexico, we have the blessing and the opportunity to coexist with the surviving mayan culture. Anyone who has been to the Yucatan Peninsula and has eaten traditional food, might have seen it, it is a very typical dressing for modern Yucatan-Quintana Roo cuisine. I decided to prepare my own version of X’nipec taking into account my particular approach on eating-food-cooking in general. Sharing the recipe and hoping that people all over the world get to try this very simple yet powerful source of well-being. 1/2 Purple Onion (typicall to the mayan mexican region) in case you can’t find it you can use white onion. 1 Habanero Pepper (typically grown in the Yucatan Peninsula) you might get it at the supermarket, since it’s an export from mexico. *There are different colors of habanero pepper, no matter which one you find, it has the same properties. This recipe is for a small bowl and a mild spicy flavor, if you can handle it more spicy you can duplicate the habanero pepper portions. In this case, I used purple onion, a regular orange (not sour because I couldn’t find it) and I added oregano and black pepper to the recipe. Rule number one of every preparation- wash your hands and work with clean utensils (as basic as it is, some people are not used to this rule). 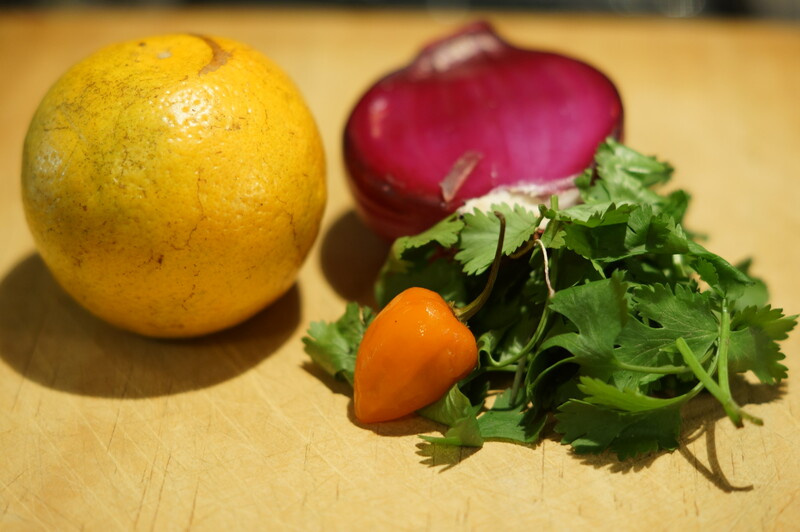 Wash all of your ingredients, cut the orange in half, chop the onion in fine cubes, wash and clean the coriander and chop it, finally chop the habanero*. *Habanero is a very spicy pepper, make sure you take proper measures to deal with it, use gloves if you need to, and make sure to wash your hands and utensils thoroughly after handling the pepper, never touch your eyes or face after handling the pepper. For my body type, I don’t enhance strong spicy flavors, so I took away the seeds from the pepper and used only one pepper to make it mild. 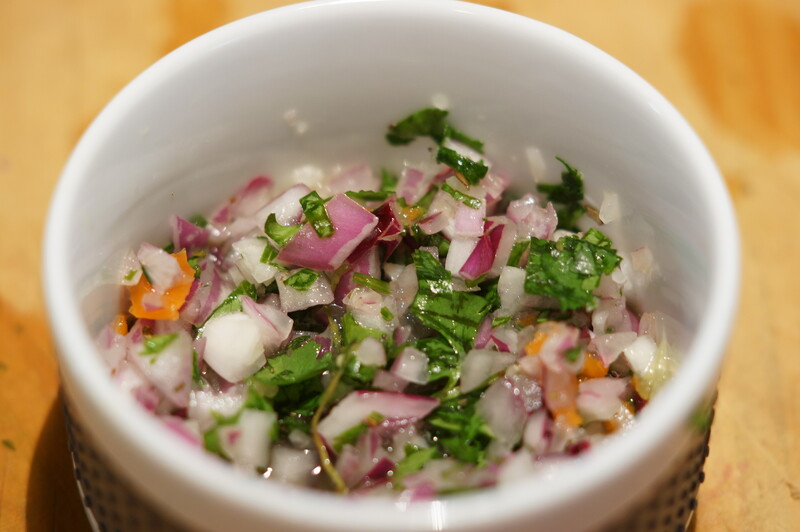 After chopping your ingredients, incorporate them in a bowl. Add the salt (I used sea salt), the vinegar, oregano and pepper (optional) and finally add the freshly squeezed orange juice. At this point you’ll be able to smell the typical flavor and tone of x’nipec. Let it marinate at room temperature at least for one hour before serving, I personally like to leave it overnight. “Food is medicine and medicine is food” That is one of the principles of ayurveda and I believe it to be true. Feeding our body is much more than tasting something or satisfying the feeling of hunger. X’nipec is an amazing medicine because it stimulates our digestion, circulation and benefits many of our organs with its ingredients. Onion: It’s the main element of our recipe and it’s almost raw, onion stimulates our papillae, it helps us to fortify our muscles (in the metabolic-celular level) and it cleans our reproductive system. 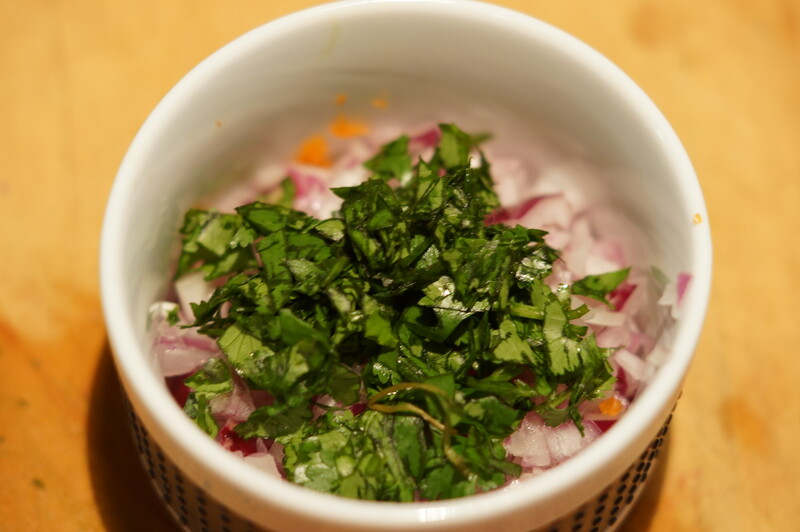 Coriander: Diuretic and cleansing, it helps us balance all of our body elements (earth, wind, fire and water). Pepper: The spicy flavor stimulates the tongue, it makes the eyes, nose and mouth produce secretions, accelerates digestion, gives way to appetite and attacks un-evacuated food residue in our intestines (toxic). Salt: Activates salivation, helps digestion and body purification. Orange: Sweet/Acid flavor, it helps build all of our tissue and body functions, the sweet flavor is associated with the sensation of joy. Acid flavor helps to hydrate the body and stimulates the cardiac function. Since it is a recipe of pre-hispanic tradition it also has a wisdom to it. Traditional pre-hispanic herbal medicine recognizes that peppers stimulate appetite, increase the production of urine and menstruation and they fortify the stomach. The intake of peppers should be moderate and balanced, because the excess of it causes intestinal and stomach damage. I also love this recipe because it’s natural and fits every diet choice. It is raw, vegan, traditional, mystic and healing.